Ireland outhalf Johnny Sexton is expected to be fit to face England in their Guinness Six Nations opener at the Aviva Stadium. The 33-year-old Sexton has been recovering from a knee tendon problem, but trained earlier this week. Head coach Joe Schmidt said: “He will train fully on Thursday, and we will then ramp up his training. 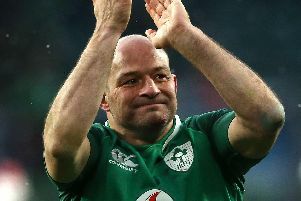 Schmidt, who revealed that injured second rows Tadhg Beirne (knee) and Iain Henderson (finger) are unlikely to feature until at least the penultimate round of the tournamen. “Iain Henderson could potentially make the last two weekends,” said Schmidt, which would be good news for Ulster fans as they look towards a European Cup quarter-final against Leinster at the end of March. Schmidt played down his side’s tag as overwhelming favourites against England. “I don’t think we are clear favourites,” he added. “The psyche is one of enormous respect. You know if you don’t get things right, England can get a long way away from you.